The NBA playoffs just tipped off, and it should be an amazing push for the Larry O’Brien Trophy. Fans in the East will be excited to see a new king of the conference crowned, as LeBron James took his talents to Los Angeles and the Western Conference. Golden State is the prohibitive favorite to win, but there are still plenty of capable players in the East that can carry their squad to a championship. Heroes emerge on a nightly basis in the postseason. With that in mind, let’s look at the five best individual offensive performances in the NBA playoffs since 2000.let’s look at the five best individual offensive performances in the NBA playoffs since 2000. The Big Three in Boston changed the landscape of player mobility in the NBA. If Kevin Garnett and Ray Allen hadn’t been dealt to the Celtics in separate deals, would LeBron James have left Cleveland? Ray Allen was one of the league’s best shooters, and he showed it in Game 6 of a first-round series against Chicago in the 2009 NBA playoffs. He dropped 51 points on 56.3% shooting, including 9-of-18 from behind the arc. The Celtics lost Game 6 of the series, but they took the series in seven. Russell Westbrook knows how to take over a game. Looking back at the highlights of Game 2 of the 2017 first-round series, it’s clear Westbrook wanted to get the 50-point mark against the Rockets. He shot 17-of-43 from the field, including a horrific 2-of-11 from behind the arc. It wasn’t enough to keep the Thunder from losing, as they fell to the Rockets 115-111. Only two other teammates (Victor Oladipo and Andre Roberson) shot more than six times in the contest. We don’t have to look too far back to find one of the greatest offensive performances of the NBA playoffs. In James’ four series against the Golden State Warriors when he was with the Cavaliers, this is arguably his best performance. He finished with 51 points and shot a respectable 3-of-7 from 3-point range as he tried to will Cleveland to a victory. The entire season seemed to be summed up in the sequence ending the fourth quarter. J.R. Smith dribbled the clock out even though the game was tied. The reaction of LeBron finding out the team still had a timeout to call in the final moments was one of the most telling signs James time in Cleveland was up, but he still put up an amazing stat line. 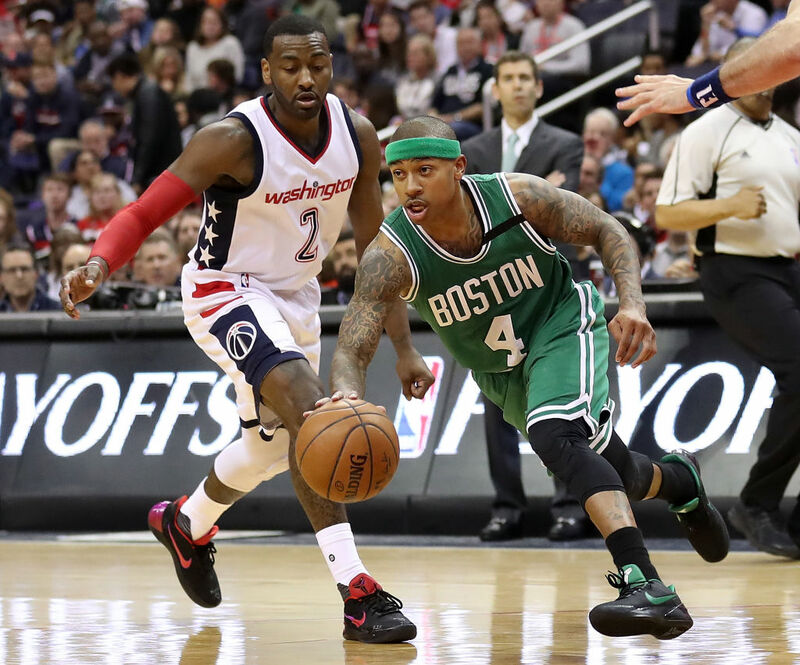 The second game of a seven-game series between Boston and Washington in 2017 was a back-and-forth shootout between Thomas and Wizards guard Bradley Beal. Beal finished the game with 40 points, but Thomas stole the show. His 53 points were a career playoff high, and he shot 18-of-33 from the field, and he went 12-of-13 from the charity stripe. The Celtics went on to win the series, but they fell short against Cleveland in the Eastern Conference Finals. The “Answer” was always viewed as one of the league’s greatest scorers, and he had a legendary game against the Hornets. Michael Jordan may have made the double-nickel a thing after dropping 55 in his return to Madison Square Garden in 1995, but Iverson put his own stamp on the term. Not known for his efficiency, he shot 21-of-32 from the floor, including 3-of-5 from behind the arc. He also dished out eight assists as the 76ers took a 98-90 victory in the first game of the 2003 NBA playoffs. Iverson went on to be one of the NBA’s best playoff performers, and his game against the Hornets was one of the defining moments of his postseason legacy. Does anyone have a chance to join the list this year? Taking a look at the best offensive games in the NBA playoffs since 2000, which one stands out to you? Who do you think can make the list this season? Our money is on James Harden filling up the stat sheet. The likely league MVP will have plenty of opportunities to put up points in the Western Conference chase.